Related Rates: See ’em in action! A short while ago, I attended the Teaching Contemporary Mathematics conference at the North Carolina School of Science and Mathematics (NCSSM). Before leaving for the conference, I had just started related rates with my kids in calculus. I have had a problem with related rates — because the problems are so bad. It’s just one of those places where you feel: this is where calculus should come alive. Well, at the conference, one of the last lectures I attended was given by Maria Hernandez. The lecture was ostensibly on using video in the precalculus and calculus curriculum. But in actuality, it was a solution to my related rates problem. Maria had created a wonderful, short activity which brings to life — visually — the idea of related rates. Of course you can write about the video projects on your blog and feel free to share the worksheets. You can add my e-mail address so folks can send me a note if they have questions. 3. This is all Maria Hernandez’s work… I am just sharing it and my experience with it in my classroom. But if you love it, send her an email shout out! You teach the basics of related rates, in the same, boring way you always do. Blow up a balloon, and ask what sorts of things are changing as the balloon blows up. (Volume, surface area, circumference if you assume it’s a sphere, tension in the rubber, etc.). Then you start talking about how these things are all connected — if you have a bigger volume, you have a bigger surface area — and as one changes, the other changes too. And related rates are how these things are changing in relation to each other. Go through some basic problems together. I use this packet of problems — where we do some together as a class, some they work with a partner, and some they do on their own. In general, I don’t do the harder related rates problems, because for my (non AP) class, I care more about them getting the fundamental ideas. Now it’s time to show the kids The Video. Play them the video once, then ask them to jot down things that are changing in time while you play it again. They will come up with things like radius of the cone, the volume of the cone, the height of the cone, the surface area of the cone, the amount of water that is being poured out of the beaker, the angle of the beaker, etc. So then you let them know their task. They’re going to be using related rates to check to see if the person pouring the water did a good job pouring it at a constant rate. To do this, they’re going to use (a) a guided worksheet and (b) Logger Pro. Let them at it however you want. In one class, I had them work on Section A and then we had a discussion about their results. In another, I let them move onto Section B without discussing their results until the end. You can figure out what will be best for you. The yellow lines are our coordinate axes (the origin being at the “bottom” of the cone). The dots give us something special. As we play the movie, frame by frame, we add these dots at various times showing where the water is at these times. Notice the wonderful thing about recording the dots on the edge of the class… the x-coordinate of these dots represents the radius of the cone, and the y-coordinate represents the height of the cone. Once the movie has been marked up with blue dots, students can see what wonderful things Logger Pro gives them! 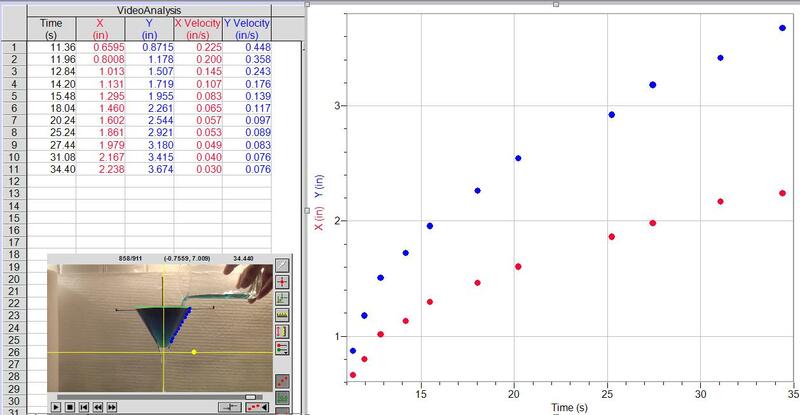 Not only does Logger Pro make a graph of radius v. time and height v. time (lovely! ), but it also gives us a spreadsheet set of data… at each time that we made a dot, we are given the radius, the height, and for free thanks to Logger Pro, and . Oh, how nice. Logger Pro gives us all our unknowns in that spreadsheet so we can calculate . And isn’t that what we cared to find out? If was changing at a constant rate? 1. When discussing Section A, you can have a very nice discussion about your students’ predictions. It was cool to discuss why the general shape of r vs. t and h vs. t should be very close to each other. 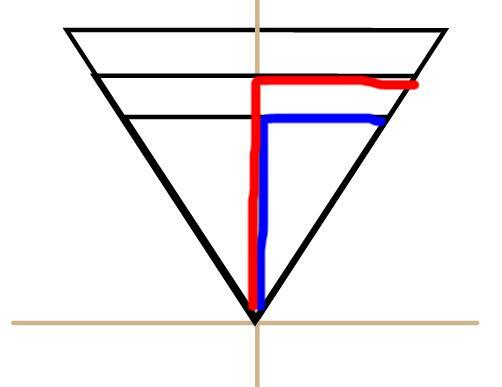 In fact, if you draw the cone filled in at different heights, you can use similar triangles to argue that however fast r is changing, h must be changing at a proportional rate. Why? Similar triangles! 2. In one class, I gave my kids class time to work on the Logger Pro part of the activity. In my other class, I had them work on Logger Pro at home. It was clear to me that the class who worked on Logger Pro in class enjoyed the activity more. There was more discussion, and they had people to talk to when they had technical difficulties. The class that had to do Logger Pro at home was not super pleased by it! My kids all conclude that the person pouring the water doesn’t do a good job. I *LOVE* this! Thanks to you and to Maria for sharing and continually improving on brilliant and inspiring ideas. Where is the Maria Hernandez video – the link does not go to it. Where in your lab instructions for LoggerPro are the “set scale” and “set axes” instructions? 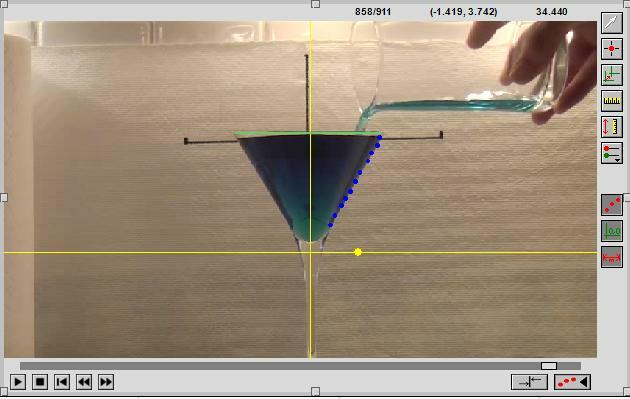 What is the diameter of the glass in your Vimeo video? I also need the video and glass dimensions. Did anyone find links to the directions and video download? 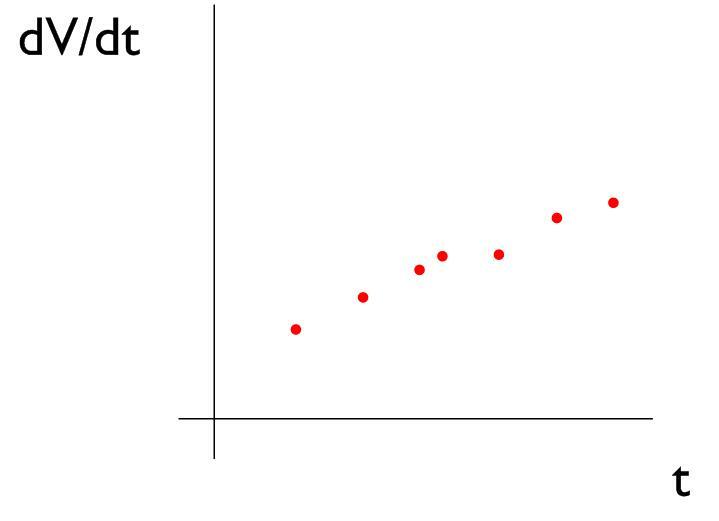 Isn’t the y-axis incorrectly labelled on very last graph that you show above (dV/dt vs. time) ? If the change in volume were constant, the dots should line up on a horizontal line, right? Because a constant function, graphically, is a horizontal line? However, if you labeled the y-axis VOLUME, then you’d be correct, because then the VOLUME is changing at a constant rate. I’m kinda under the gun with getting stuff ready for school, so I don’t have time to relook at this. But apologies if there is any mistake in this!